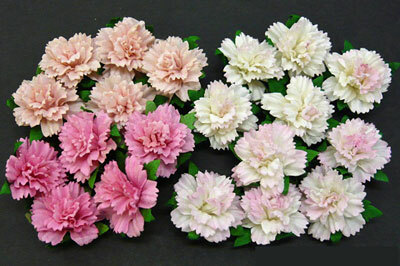 Wild Orchid Crafts Carnations Mixed Pink RESTOCKED! Beautiful handmade mulberry paper carnation flowers from Wild Orchid Crafts. Mixed pink mulberry paper carnation flowers. Width of flower head is approx. 25 mm. Stem length is approximately 6 cm. Price is for a package of 20.